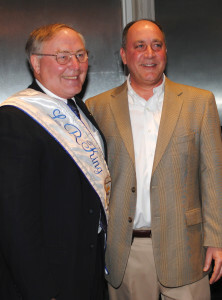 Festival king, retired astronaut Jerry Ross, left, is introduced to the crowd at the Lunar Rendezvous Kickoff Party by the 2014 Lunar Rendezvous king, Jerry Foyt, who is general manager of Mercedes Benz of Clear Lake. Retired astronaut Jerry Ross will reign as king over this year’s Golden Jubilee Rendezvous Festival. He was introduced as Lunar Rendezvous began celebrating its 50th anniversary at its Golden Jubilee Kickoff Party March 28 in the NASA Hilton’s Admiral Ballroom in Nassau Bay. Jerry Foyt, the 2014 Lunar Rendezvous Festival king, introduced Colonel Ross to the standing-room-only crowd that cheered his selection. Among the celebrants were several former festival chairmen, kings and queens, advisory board members and volunteers who have made the festival a big success every year since its founding by the late Maggie Plumb DeNike and the Clear Lake Chamber back in 1966. 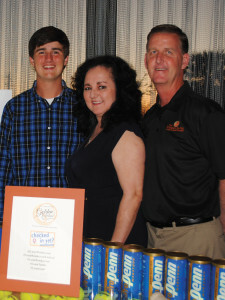 Tennis Tournament Co-Chairmen Kevin and Ruth Duke, right, prepare to sign up players for the April 24 event during the Lunar Rendezvous Kickoff Party at the Hilton, with help from their son, Ashton. 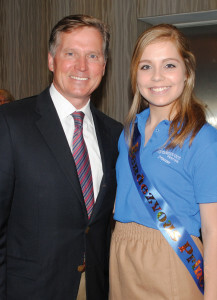 Past Advisory Board President Michael Reeves served as chairman of the Kickoff Party. Born and raised in northwest Indiana, Ross said he was in the fourth grade when the first satellites were launched into space and those events caused him to decide to go to Purdue University, to become an engineer, and to get involved in our country’s space programs. After earning his master’s degree at Purdue, he entered the Air Force, graduating from the Air Force Test Pilot School in 1976 as a flight test engineer and helping conduct flight testing of the B-1 bomber. Ross came to the Johnson Space Center in February 1979 to work on the Space Shuttle program. In May, 1980, he was selected as an astronaut. He flew on Space Shuttle missions STS-61B in 1985; STS-27 in 1988; STS-37 in 1991; STS-55 in 1993; STS-74 in 1995; STS-88 in 1998; and STS-110 in 2002. Former Texas Railroad Commission Chairman Barry Smitherman, now back practicing law with Vinson & Elkins, and his daughter, Princess Louisa Smitherman, enjoy the Lunar Rendezvous Kickoff Party. With seven missions, he set and still holds the individual world record for the number of space flights flown. During his astronaut career he performed nine spacewalks, including three on STS-88 that started the assembly of the International Space Station. Colonel Ross has logged more than 4,100 flight hours, received numerous awards and has authored three books. He has been married for more than 45 years to his wife Karen. He is the father of a daughter and a son, and a grandfather of three beautiful granddaughters. He retired from NASA in 2012 and was inducted into the Astronaut Hall of Fame in 2014. Colonel Ross says he feels extremely blessed to have lived his dream and to have served our great country in such a unique, exciting, and rewarding way.